If you want a Premium touring experience in New York City, this is your tour. Statue of Liberty Pedestal tickets included. Book this tour with the NY See The Best! for only $172.50! It’s a two-day experience you will never forget! Call us to SAVE at 212-852-4821 to book. This is THE tour to take in New York City. Statue of Liberty – This tour includes reserved “cut the line” tickets to the Statue of Liberty’s Pedestal Observation Deck! Central Park to Wall Street – The tour covers Manhattan from Central Park uptown to Rockefeller Center to Wall Street to the 9/11 Memorial to the Statue of Liberty. 6 Fully Guided Stops – The Tour Guide will hop off with you at 6 different stops in New York City. Top Rated Tour – Trip Advisor Certificate of Excellence for 4 years in a row. See Reviews Here. Unless you arrange a private tour, this is THE BEST way to experience New York City. You can sit back and relax as your tour guide shows you New York City in the most efficient way possible. You will travel by foot, bus, and boat on this tour. We will show you where to get the best pictures of the Statue of Liberty, Empire State Building, 9/11 Memorial, One World Trade Center, and Central Park. Let’s face it, you don’t get to come to New York City every day. When you go to all the trouble of making the trip, you should take the best tour you can find so you truly experience New York, New York without the hassles of waiting in lines and having to figure out how to get around town on your own. This is THE tour that you should take. * Includes a ticket on the Statue Cruises ferry to Liberty Island to visit the Statue of Liberty. ($18 per person value)! This tour goes to the Statue of Liberty. You will have to pass through a security checkpoint. There is a long 8-block walk through the Canyon of Heroes, down Wall Street, and to the 9/11 Memorial on this tour. You will enter the 9/11 Memorial, but there will not be time to visit the 9/11 Museum, so please plan to visit the Museum on another day. 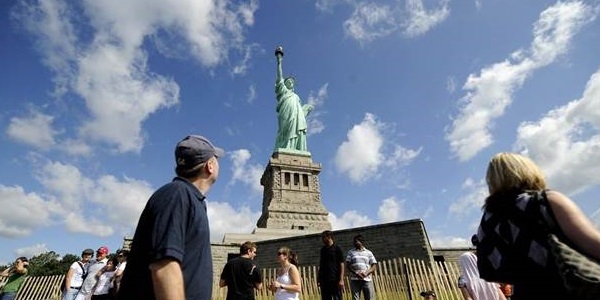 Lunch is available for purchase on Liberty Island, but is not included in the price of the tour. Refund Policy In an effort to keep our prices low all sales are final. If you’re uncertain of your travel plans and feel they might unexpectedly change, please purchase our optional Tour Insurance.